"There is no vocabulary for this, the no-language of grief...so the world says it for me." The above quote, (from "The Baffling Dead" by Irene Earis) is an example of the words and images that make up "The Language of Grief. 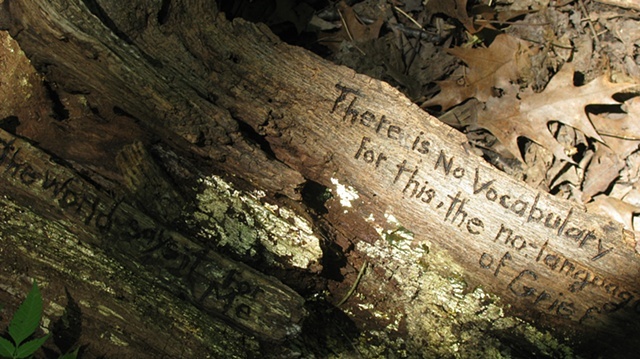 Fallen logs are inscribed with text and images, and the scars in the wood are bandaged with gold leaf. The inscriptions are derived from appropriate religious, literary and historical sources. The project draws on our deep connections to the forest and the concept of the Tree of Life, a many branched construct illustrating the idea that all life is related, which has been used in science, religion, philosophy and mythology.